335 W. South Boulder Rd. Join us for an evening with the local A cappella group Face Vocal Band http://facevocalband.com/ and a silent auction. 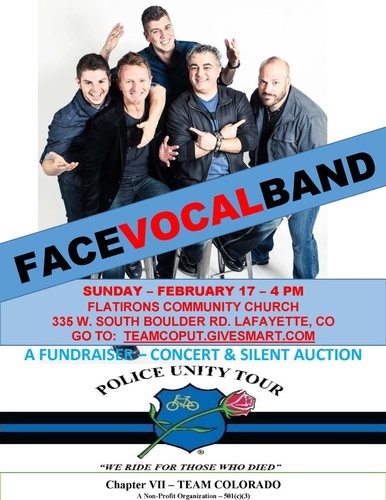 The proceeds of this fundraiser will directly assist the Colorado team participating in the 2019 Police Unity Tour. The Police Unity Tour riders and support donate to the Law Enforcement Memorial in Washington DC, as well as supporting family members of fallen Law Enforcement Officers to attend Police Week. Each participant must raise $1,900.00. Thank you for helping us raise money for this worthy cause. You can also donate online at link provided.